The “Health Right” concept began in Charleston, West Virginia, in the 1980s, when Nancy Lipphardt served as the president of the Charleston Soup Kitchen. Increasingly, the soup kitchen clients were the “working poor”, a population earning enough to be ineligible for Medicaid, yet unable to afford private insurance. In response to those living in the medical health care gap, and with one volunteer doctor on board, the first West Virginia Health Right was born. Lipphardt came to Wheeling in 1984, imported the “Health Right” concept, and championed its organization here. A core group made up of representatives from Northern Panhandle Behavioral Health Center, West Liberty State College, Wheeling-Ohio County Health Department, Wheeling Hospital and Ohio Valley Medical Center established commitments from medical providers for free inpatient, outpatient, and laboratory services. A working board of directors formed, electing Nancy Lipphardt as president. Dr. Jeffrey Shultz of OVMC agreed to serve as the medical director of Wheeling Health Right. The groups established the goals of the organization: provide basic primary health care to those persons unable to obtain such care through currently existing health programs; facilitate entry into currently existing programs for those unaware of the resources; and promote health. With a clear mission and firm commitments from health care providers, Wheeling Health Right was incorporated in August 1985. St. Matthew’s Episcopal Church donated the first administrative office. The WV Department of Health made a base grant to hire an administrator and to launch clinical services. The first administrator, Phyllis Sharpenberg, was hired in April of 1986. Dr. Thomas Thomas of the Wheeling-Ohio County Health Department allowed the clinic to set up in the WIC Program office (70 Fourteenth Street) on Monday evenings from 6 to 9 PM. The volunteer doctors and nurses greeted the first patients on September 8, 1986. By the second week there were fifteen patients. 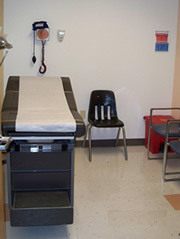 Working in collaboration with other social service agencies in the area, Wheeling Health Right did not duplicate services that were already available. A referral agreement was reached between these agencies and the clinic so that all available needed services could be offered. By January 1987, Peggy Knuth (Ferguson), RN, FNP, was hired as the first paid clinical staff person. Knuth added nursing clinics to the schedule, which cut down on the onslaught faced by physicians on Monday nights. Physicians frequently treated acute health crises in those first months, as many in the community had long existed without any preventative care. Given the choice between food and shelter for their family or health care, they were forced to delay treatment for many severe medical conditions.